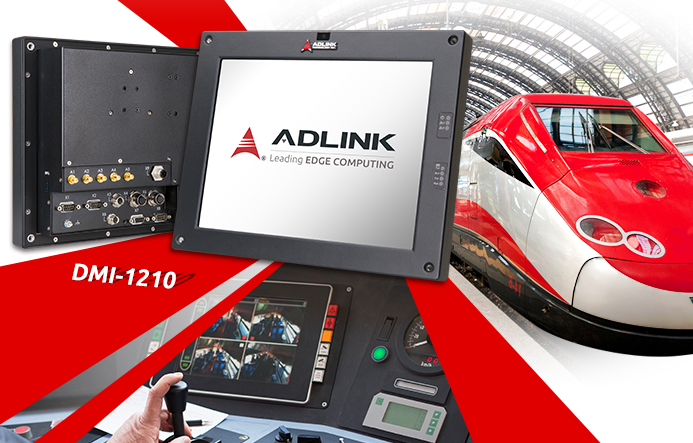 ADLINK Technology has released its latest Driver Machine Interface (DMI) touch panel computer, the DMI-1210, designed specifically for train control and driver information display. Powered by the Intel Atom x5-E3930 processor (formerly Apollo Lake) and featuring a 12.1” (4:3) high resolution color display, 5-wire resistive touch screen and securable I/O interface, the DMI-1210 can be deployed as an HMI unit for driver’s desks, control panel for passenger information systems, surveillance system control/display unit or in railway diagnostics and communications applications. The DMI-1210 is an EN 50155 certificated, cost-effective, commercial-off-the-shelf (COTS) driver interface that offers train radio display, electronic timetable, and diagnostic display functions and additional functionality such as train data recorder. The DMI-1210 supports full range DC power input from +16.8 V to +137.5 V DC. Optional MVB, GNSS, 3G/LTE, WLAN and Bluetooth through add-on modules give system integrators the necessary tools to expand use case possibilities. With ADLINK’s built-in Smart Embedded Management Agent (SEMA) management and status LEDs on the front panel, the DMI-1210 provides easy and effective health monitoring and system maintenance. In addition, system robustness and reliability are provided by careful component selection for extended temperature operation, isolated I/Os, conformal coated circuit boards, securable I/O connectors and high ingress protection rating (IP65 front, IP42 rear). 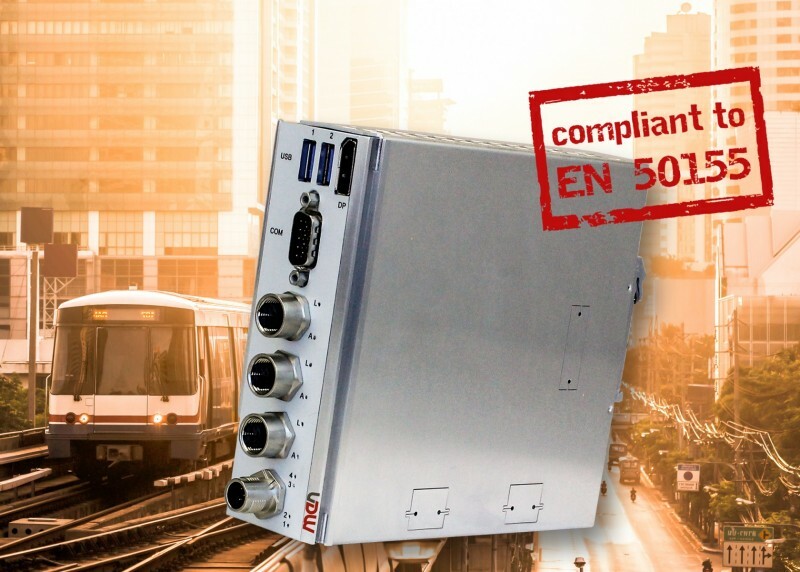 MEN Micro has announced the MC50M, a modular DIN rail box PC for embedded applications in transportation. The computer platform is based on Intel’s Atom E3900 CPU series. This makes the MC50M the ideal basis for functions such as security gateway, predictive maintenance, CCTV, ticketing systems or as a diagnostic server. The MC50M can be used as a stand-alone product or in combination with a range of pre-fabricated extension modules, providing additional features and short delivery times. Extension modules can provide application-specific functions such as wireless communication (LTE advanced, WLAN, GNSS), MVB, CAN bus or other I/Os. A removable storage shuttle supports the integration of one to two 2.5″ SATA hard disks/SSDs. The wide range PSU allows isolated power supply from 24 V DC to 110 V DC nominal and extends the entire system to EN 50155 compliance. The board management controller provides increased reliability and reduces downtime. The Trusted Platform Module supports security and encryption features. With the ignition switch for remote startup and shutdown control, the platform provides additional energy saving features. The aluminum housing with cooling fins ensures conductive cooling and fanless operation. The MC50M has no moving parts, so it can be operated maintenance-free. The long-term availability of 15 years from product launch minimizes life cycle management by making the MC50M available for at least this period. MEN’s DIN rail concept is designed for flexible configuration of module combinations and is suitable for embedded IoT applications in various markets. The CPU modules can be flexibly combined with various expansion modules and power supplies. In the modular system, the data transfer between the individual modules as well as the power supply of the components is implemented via the expansion connectors standardized by MEN.The concept specifications include housing dimensions, mounting, cooling and IP protection. In addition, the expansion connectors and their pin assignment are defined. DIN rail mounting (35 mm) is standard. Wall and 19” rack mounting is possible using adaption brackets. 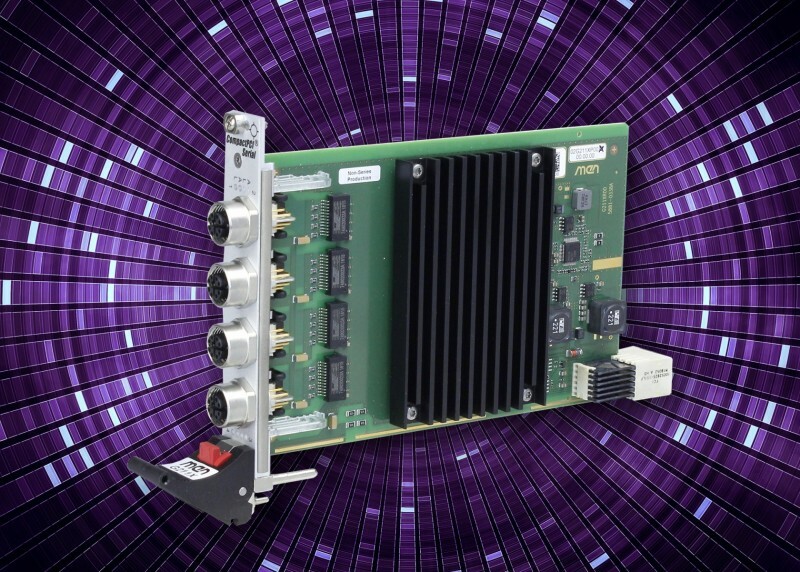 Aimtec has Introduced the AM20CWR-ZK and AM25EUW-Z railway DC-DC converters. They are 20 W and 25 W devices respectively. The AM20CWR-ZK series offers a a wide input voltage range of 13-176 VDC and an output voltage range from 3.3 V to 15 V. The AM25EUW-Z series offers a 10:1 input voltage range of 16-160 VDC and provides an output voltage range from 5 V to 24 V.
Both series provide an inbuilt heat sink offering wide operating temperature range, from -40°C to 100°C. The devices also feature an isolation of 3,000 VDC for improved reliability and system safety. Furthermore, a higher MTBF of 190,000 hrs., output short circuit protection (OSCP), output over-current protection (OCP) and an output over- voltage protection (OVP) come standard with both series. 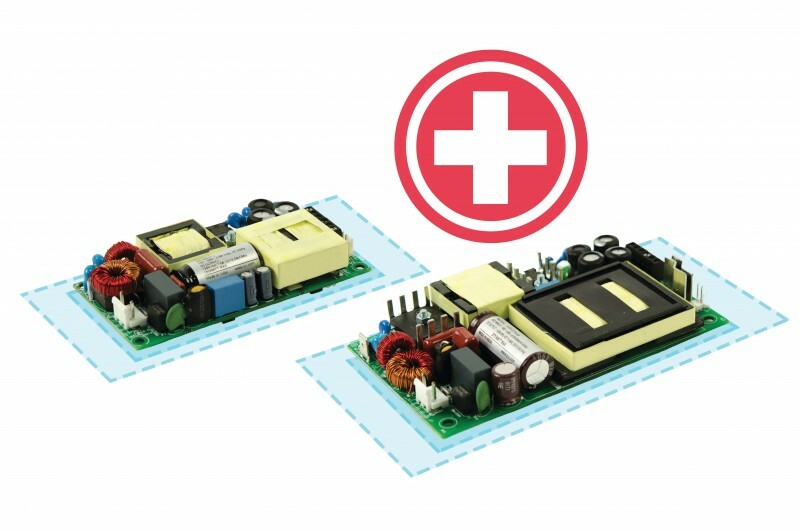 The AM20CWR-ZK is offered in a 1 x 1 package and the AM25EUW-Z in a 2 x 1 package. 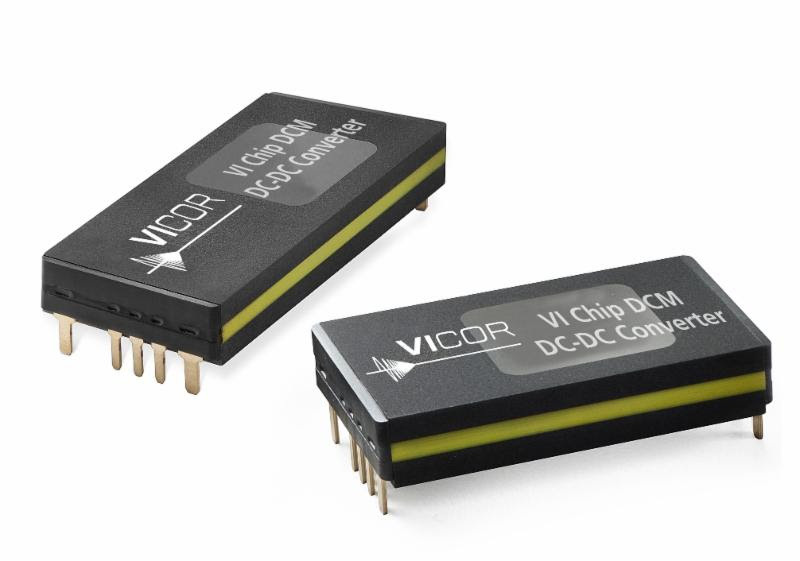 Vicor has released its next generation of DCMs with a family of wide input range (43 V to 154 V input) 3623 (36 mm x 23mm) ChiPs with power levels up to 240 W and 93% efficiency, targeted at new rail transportation and infrastructure applications. 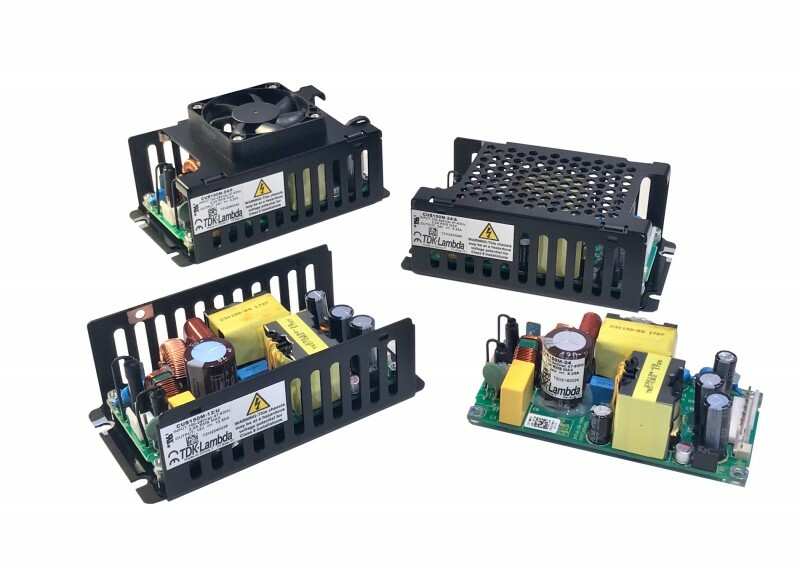 Modern rail infrastructure requires a wide range of DC-DC converters to power a variety of new services for both freight and commuter markets. The DCM is an isolated, regulated DC-DC converter module that can operate from an unregulated, wide range input to generate an isolated DC output. 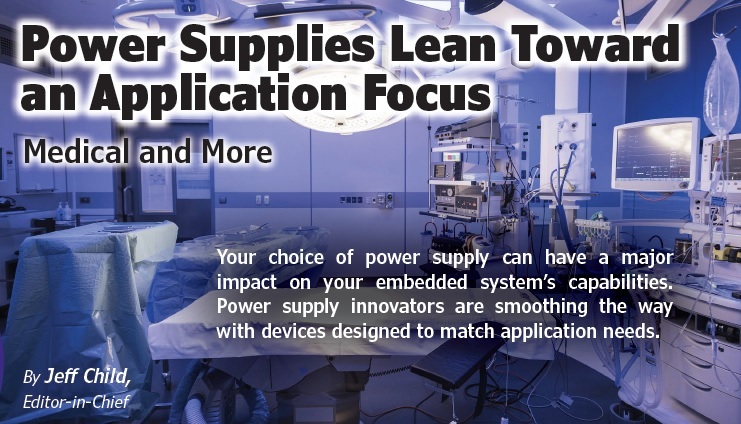 These new ChiP DCMs simplify power system designs by supporting multiple input voltage ranges in a single ChiP. With efficiencies up to 93% in a ChiP package less than 1.5 in2, these DCMs offer engineers leading density and efficiency.